We're huge fans of homemade beef and broccoli, but many people are still afraid of the green florets. This is the broccoli-free version of your favorite takeout stir-fry. We like to use red and green peppers (because they make the dish so dang pretty! ), but you can swap in whatever colors you like best. Make sauce: In a medium bowl, whisk the soy sauce with the vinegar, sugar, and cornstarch. Set aside. In a large skillet over high heat, heat 1 tablespoon oil. Add flank steak, season with salt, and cook until cooked through and seared on all sides, about 8 minutes. Remove steak to a plate. Add 1 tablespoon remaining oil and red and green bell peppers to the skillet. Cook until softened, about 4 minutes. Add the garlic and ginger and cook stirring until fragrant. 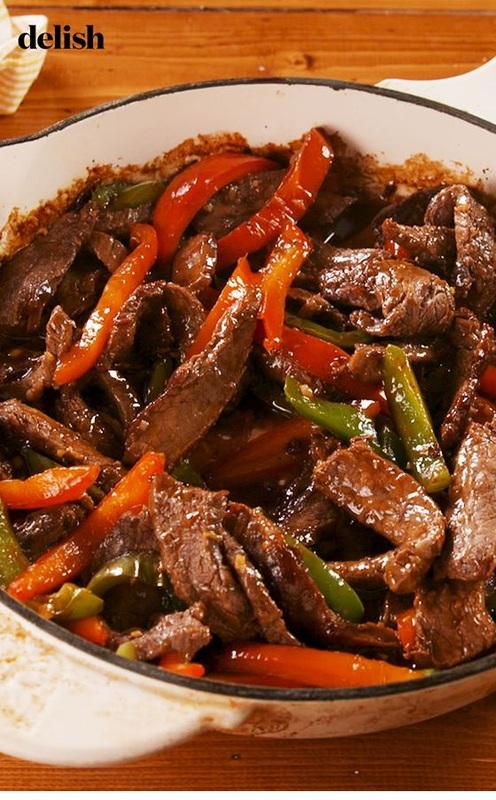 Return the beef to the skillet and pour over prepared sauce. Cook, stirring, until the sauce is glossy about 2 minutes more.